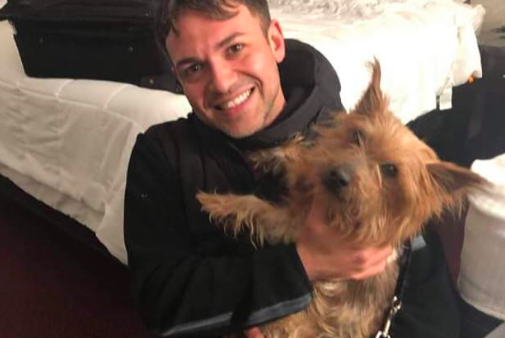 Yorkie, Buddah, returned to his owner, John T., in Wall Township, New Jersey. More than a year after a New Jersey man had his dog stolen from his car while visiting Richmond, a local animal rescue returned the pooch to its rightful owner. Richmond Animal Care & Control posted on Facebook Thursday that the yorkie, named Buddah, was picked up as a stray earlier this month. With the help of the dog's microchip, the non-profit shelter traced the owner back to Wall Township in South Jersey. “Needless to say the previous owner was elated that is dog was found unharmed and was safe with us,” the post stated," the shelter wrote. Buddah's owner was unable to drive to Richmond to pick up the dog, so shelter volunteers took the road trip north to reunited them. "In the world of animal welfare it’s easy to slip into a negative frame of mind. So many animals in need, heinous crimes being committed and cruelty investigations tend to cloud our perception from time to time," the shelter added. "We all needed a little reminder that this world is full of wonderful people and that love and kindness will always win."